Our Flagship product assembled & tested. 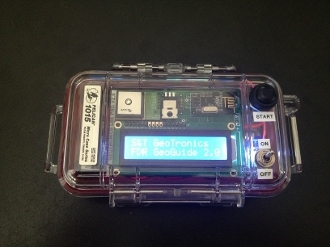 This device allows the user, among other things, to perform simple Inverse Geocaching, Multi-stage Geo-Guide, Wireless Twins (2 required), etc. Fully assembled & tested device is made up of (same components as the kit, but also includes the Pelican 1015 case): - LBE Pro PCB - Arduino Pro/Mini - SKM53 GPS - Parallel 1602 LCD - SD card Reader/Writer - NRF24L01 Wireless Transmitter/Receiver - N/O Button - On/Off Switch - IRF510 MOSFET - 3181 Opto-Coupler - 9 Volt Battery connector - Resistors - Header Pins - Pelican 1015 case You will also need an FT232RL USB to Serial Adapter to reprogram the Arduino Pro/Mini. Picture shows completed product in its Pelican 1015 case, and all individual components just for your information. No assembly required. As always, all our products are Open Source so the source code is available.